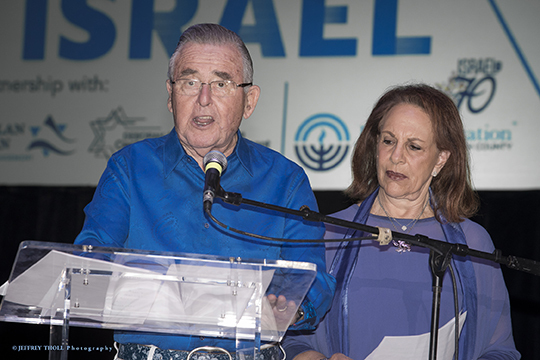 Amid a sea of blue and white, nearly 3,500 local residents and leaders came together in solidarity, spirit and vibrant Jewish diversity to celebrate the 70th anniversary – and the miracles - of the modern State of Israel. The enthusiastic crowd was transported to the sights, sounds and tastes of Israel, right in Mizner Park Amphitheater on April 18, as Yom HaZikaron (Israel Memorial Day) transitioned into Yom HaAtzmaut (Israel Independence Day). Israel Fest was presented by the Jewish Federation of South Palm Beach County, with its Judi & Allan Schuman Center for Israel Engagement and Deborah & Larry D. Silver Center for Jewish Engagement. Debra and Larry Halperin chaired the evening, and Judi and Allan served as Honorary Chairs. Squire Patton Boggs was the generous Israel Fest Presenting Sponsor. Corporate Sponsors included Boca Raton Regional Hospital, BNY Wealth Management, Hotwire Communications and Polen Capital. The event’s media sponsors were ESPN West Palm, The Florida Jewish Home and WLRN Public Media. Corporate Partners included Silverstein HR; Lesser, Lesser, Landy & Smith; and Morgan Stanley/The Popper Group. The PJ Fun Zone is generously sponsored by Smiles by Dr. W & Dr. R Quality Orthodontics and Florida Blue.